Salt Lake City has long held a reputation as one of the West’s most-bikeable cities. That’s about to change, however, as several organizations are teaming up to turn Utah’s capitol city into a bike-friendly like few others in the country. 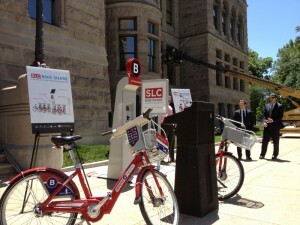 A new bike share program is set to launch, providing bikes which downtown Salt Lake City workers, residents and visitors can use to navigate the city’s streets on two wheels – and make the city a healthier, cleaner, less congested place in the process. The bike share program is different from what many might anticipate. Rather than random clunker bikes parked around town for people to use – or misuse – bike share is more of a membership club for urban cyclists. Members are able to check out a quality bicycle much like they would a book from a library. Not only is Salt Lake City’s government getting behind the program, a handful of businesses are giving the new bike share system a big boost in the budget. SelectHealth, Rio Tinto (Kennecott Utah Copper), Fidelity Investments, Backcountry.com and Visit Salt Lake have kicked in funds to get the project rolling. The official launch for the program is expected to happen in March of 2013 after custom bikes are orders and bike docks installed. Aside from the benefits of getting around time quickly and quietly, there are the plentiful health benefits associated with cycling activities. The quick-trip nature of the Bike Share program should be a hit with the urban business district that doesn’t want to deal with the hassle of driving – and parking – on short trips across town. The Bike Share bicycles won’t be your typical fixed-gear rides often seen downtown. Instead, the bikes will be custom built to cater to cyclists of every skill level and style of dress. Helmets for Bike Share members will be provided by Intermountain Healthcare, the press release said.